Lighting-Gallery-net - Fluorescent - T-12 and larger/Standard cool white is back! Standard cool white is back! Is this based on Philips made? Then, why does it has the Philips location symbols and date code? Is it really an "old school" halophosphate CW? Haha! This actually answers one of my questions...if the old style order code could be used on lamps after EPACT. Are those full wattage? Or are they ewwwww? Oh good ewww wasn't a good name, so now is this a 60watt lamp or a 75watter? Wow, I got you guys. It's actually a CW Supreme, but PQL somehow just calls it cool white. Sylvania somehow calls the F40T12/930 "warm white". Well it is cool white. No one really cares what variation it is lol. IMO the packaging should have whatever crap the government wants and the lamp etches should just be what they've always been: /WW, /W, /CW, /D, and whatever 5000K was abbreviated as. WOW! I want some! I am planning on resurrecting some pretty rusty, from sitting in the weeds since 1991 to properly "season", 1, 2, and 4 lamp strips for the lean-to on the back of the garage where the welding bench is. I can use some of the full wattage older lamps I have on hand, but could use a case or 2 of these! Where can I get them? I really despise anything Phileeps makes, but these DO look well made like the old Westies! These would be the Cow's Teats in those fixtures installed in an exposed, non walled off area! the ES junk tend to kill ballasts and never warm up in cold weather. Me wants some! Where to get? Dave--help me out here dude! I'd like some F96T12/D too! 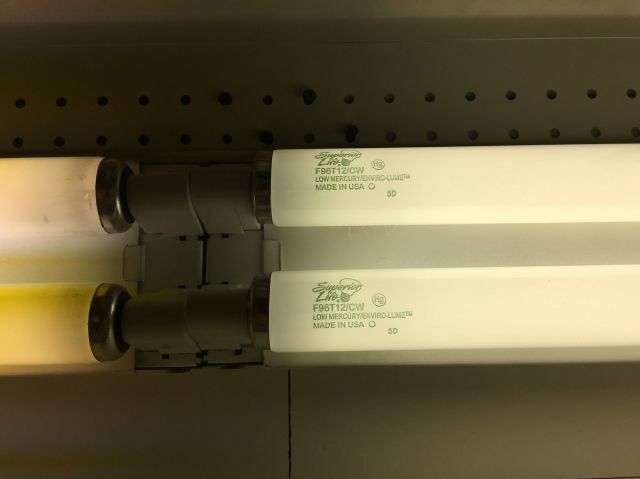 I said in the comments they are actually Cool White Supreme in disguise, they are 4100K 89 CRI. Brighter than a deluxe cool white, with a somewhat similar spectrum to the early Ultralumes from the late 1970s. Just go and buy some CW Supremes at Home Cheapo, and mark the green end caps black with a sharpie!